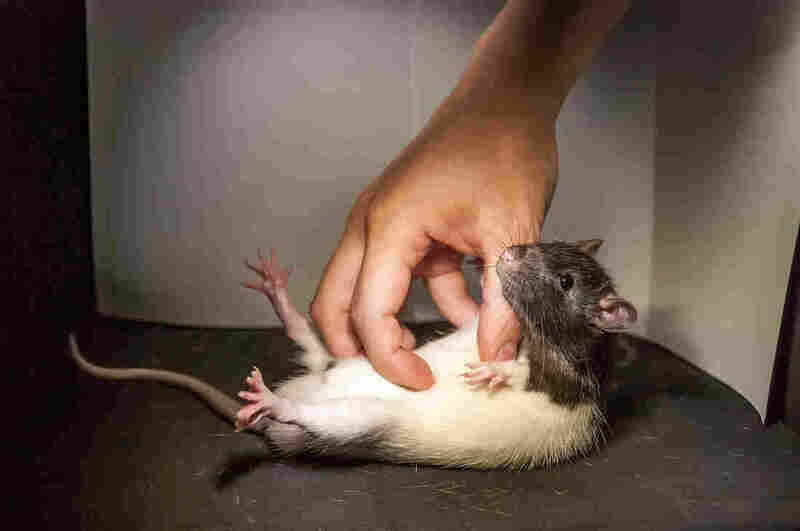 When in a playful mood, rats like a gentle tickle as much as the next guy, researchers find. Scientists have pinpointed the ticklish bit of a rat’s brain. Although virtually every human being on the planet has been tickled, scientists really don’t understand why people are ticklish. The idea that a certain kind of touching could easily lead to laughter is confusing to a neuroscientist, says Shimpei Ishiyama, a postdoc at the Berstein Center for Computational Nueroscience in Berlin, Germany. To try and get a handle on how tickling works, Ishiyama studied rats, who seem to enjoy being tickled, according to previous research. He inserted electrodes into the rats’ brains, in a region called their somatosensory cortex. When rats enjoy tickling they emit high-pitched “laughter” that can’t normally be heard by humans, the scientists found. In this video, the researchers transposed the audio of the squeaks to a lower frequency you can hear. That’s a part of the brain that processes touch, and when Ishiyama tickled the rats, it caused neurons in that region to fire. The rats also seemed to giggle hysterically, emitting rapid-fire, ultrasonic squeaks. Earlier research has shown rats naturally emit those squeaks during frisky social interaction, such as when they are playing with other rats. Next, Ishiyama pretend-tickled the rats by moving his hand around the cage in a playful manner. Rather than withdraw, the rats sought more contact. Again, he saw the neurons in the somatosensory cortex firing, even though the rats weren’t being touched. This suggested to him that anticipation of tickling could trigger the region of the brain that responds to touch — even without the physical stimulus. Finally, Ishiyama stimulated the somatosensory cortex directly, by sending an electrical signal directly into the brain. The rats squeaked the same way, suggesting that this region really is the tickling epicenter of a rat’s brain. Ishiyama says that was a clear “eureka moment.” The role of the somatosensory region of the brain appears to be more complex than originally thought. Rather than being a simple signal-processing center, he says, the region seems to have some connection to emotion. The result is another important step in understanding ticklishenss, says Jaak Panksepp, a psychobiologist and researcher at Washington State University, who studies animal tickles. Panksepp says that the evolutionary origins of ticklishness remain unclear, but he thinks that it may have evolved to encourage play, which in turn teaches social animals how to interact.